Laser Resurfacing - What is it and How Can it Improve My Skin? Laser Resurfacing – What is it and How Can it Improve My Skin? Is your skin looking older than it should? Do you have acne scars that bother you every time you look in the mirror? Do you use the best skincare, avoid the sun and eat right, but feel that your skin has lost its brightness and luster? Or maybe you keep up on your Botox and fillers, but notice that despite all that, you’ve got more sunspots, finer wrinkles or laxity of your skin than you would like? If you’ve asked yourself any of these questions, then it may be time to consider laser resurfacing. When laser resurfacing was first done to treat wrinkles in the late 1980’s, it was kind of a one-size-fits-all procedure. Everyone was treated similarly, regardless of what the particular problem was. The recovery was long and loaded with potential pitfalls that could leave you looking worse than before you started! In 2016, laser resurfacing is all grown up. The technology is advanced, precise and sophisticated. Today, it’s a treatment that is totally, 100% customizable to each patient. At Celibre Medical Corporation, we use the term medical laser resurfacing to refer to treatments that renew and rejuvenate the skin. We use over 20 different, state-of-the-art lasers to tailor a treatment targeting any or all of your skin problems. From fine lines and wrinkles, to sun damage or pigmentation, to acne scars and large pores, we can help you find the best treatment to help your skin look smoother, fresher and years younger. 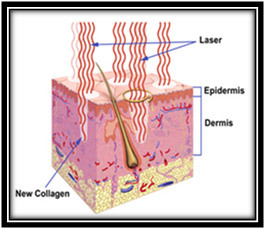 In very basic terms, laser resurfacing is way to force the skin to heal itself with new, fresh skin. These lasers use energy to “ablate” or remove the skin and/or heat it in order to precisely and accurately create a wound. This process can involve removing the outer layers of skin and damaging the deeper layer, which is where collagen lives, telling the body to make more and replace the damaged or dull surface cells with new, brighter skin. If you’ve ever worked out at the gym, you know that sore feeling you have the next day. That’s your muscle tissue, which has been damaged by the stress of the exercise. Soon, if you keep it up, your muscles heal and adapt, and end up looking bigger and more toned in the process. You can think of your skin’s response to laser resurfacing in the same way. The laser is the exercise and your skin is the muscle. The goal of the treatment is to carefully and precisely injure the skin, and force it to adapt and heal. The end result is skin that looks firmer, clearer and smoother! 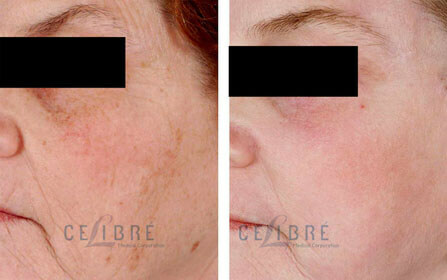 Celibre Medical Corporation is proud to offer the latest in laser resurfacing technology: fractional laser resurfacing. Our laser, added in 2013, is the Sciton Profractional. It allows us to dial in more control in the resurfacing process, deliver great results and decrease your downtime. Fractional laser resurfacing technology does this by only removing or damaging a fraction of the skin. This means that in between every pinpoint area of injury, there is a little “island” of normal, healthy skin. Because of this, the skin will heal itself faster than if the entire surface layer was removed. While it used to take weeks to heal with past technologies, fractional treatments can heal in 4-7 days! And surprisingly, the results are very comparable to treatments that remove the entire outer layer. What Makes Laser Resurfacing Different than Other Procedures? 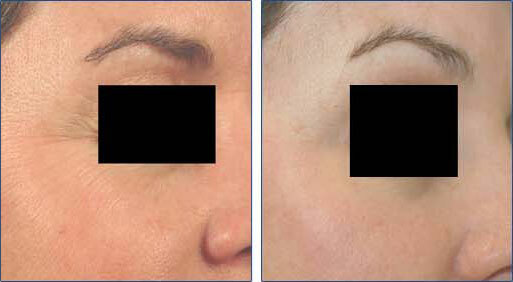 The difference with laser resurfacing is the control over the process these lasers allow. Laser resurfacing is a simple yet very precise treatment. Different skin types will require different lasers. And depending on the target problem (wrinkles versus acne scars), the settings on the laser can be adjusted to precisely target the level or layer of skin that can give the most improvement. While older procedures like dermal-abrasion and deep chemical peels, still have their place, more and more practitioners and patients are turning to laser resurfacing instead because it gives better, more consistent results for these tough problems. Because the injury can be targeted to the exact problem level of the skin, treatments are both predictable and effective. While the experience of your laser practitioner still matters a lot, the specificity of these devices helps take a lot of the guesswork out of the equation. Laser resurfacing gives you better, more consistent results. So what does all this mean to you? It means that we can fully customize a treatment that not only meets your specific needs but also delivers great results. In addition, with our vast array of devices, we can help you choose a technology that fits your recovery schedule. Laser resurfacing is no longer the one-size-fits-all treatment of decades ago. Give us a call today. Celibre Medical is one of the premier laser dermatology facilities in the Los Angeles area with 30 years of experience. One of our laser resurfacing experts would love the opportunity to sit down with you and make a plan to discuss what our laser resurfacing program can do for you. Contact us today to schedule a FREE laser skin resurfacing consultation!